We offer several glazing options to best suite your needs or preferences. There are many things to consider when making a choice in glazing. You should think about where the piece will hang, light from windows or lamps may cause a reflection on the surface. In these situations you may want to consider using non-glare over a standard clear glass. 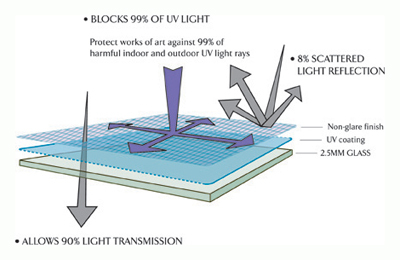 UV Blocking glass products will protect your artwork from harmful UV light. We also offer Tru-Vue Museum glass for those items that deserve the very best. Along with these glass choices we also carry a full line of acrylic/plexiglass options. This is an alternative to glass is an acrylic glazing (commonly referred as Plexiglass or Plexi). Premium Clear, Reflection Control, Conservation Clear, Conservation Reflection Control. Museum Glass is the highest quality anti-reflective picture framing glass available in the industry. It protects against 99% of harmful indoor and outdoor UV light rays and has the highest light transmission along with the lowest reflection rating of any other glass product. The result is consistent, durable quality and the most attractive display for artwork. 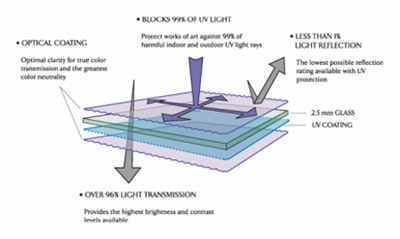 Pros: Up to 99% UV Protection - Slows down fading in normal lighting conditions. Highest-quality glass available. but still maintains the clarity of clear glass. Framing glass with 99% UV protection helps protect art from fading by blocking harmful indoor and outdoor light rays, preserving art for years longer than regular glass. Concervation Clear glass works well with all framing applications. Can be used with any number of mats. 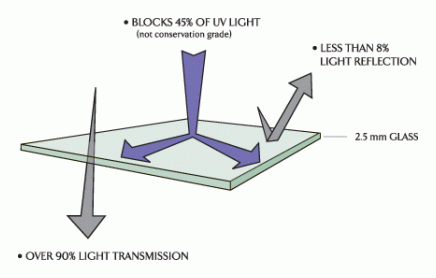 Reflection Control with 99% UV Protection is chemically finished on one side, scattering light as it strikes the glass. This matte-like finish enhances the beauty of the artwork by protecting the piece from unwanted glare or distortion. This glass can be used with up to two mats away from artwork without significant resolution loss. 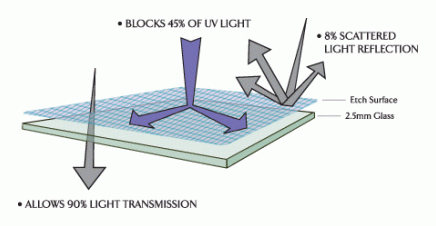 Up to 99% UV Protection - Slows down fading in normal lighting conditions. Artwork deserves the highest quality regular glass available and you can find it with Tru Vue Premium Clear framing glass. This quality durable glass provides 45% UV protection and designed for art that needs minimal conservation. Pros: Etched one side defuses light to minimize reflection. no conservation properties against fading. Here is an example of why you should consider a UV Blocking Glass, in this image you can clearly see the fading & sun damage caused by exposure to UV light.